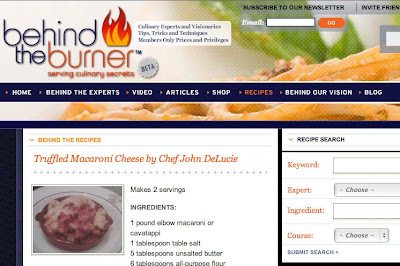 Hot webspot Behind The Burner may just be the Justic League of the culinary world; a site where the World's top chefs and visionaries join forces, sharing their secrets and techniques via video tutorials, recipes and articles. "At the time we started it, most restaurants that were doing truffles were charging considerably more than us, but they were calling their dish “Pasta con Tartufi Bianco.” We called ours “mac and cheese with white truffles,” and the press went berserk." Adjust oven rack to lower-middle position and heat broiler. Bring 4 quarts water to boil in Dutch oven over high heat. Add macaroni and 1 tablespoon salt; cook until pasta is tender. Drain pasta and set aside in colander. Transfer mixture to broiler-safe 9-by 13-inch baking dish and broil until crumbs are deep golden brown, 3 to 5 minutes, rotating pan if necessary for even browning. Cool about 5 minutes, then serve. Shave seasonal truffles over each serving. En Vitesse: Babycakes LA Update! Gala Parfait: Southeastern Asian.. Baby Shower!